This morning in Aleppo, a leader of the Syrian regime's forces was killed by FSA fighters. 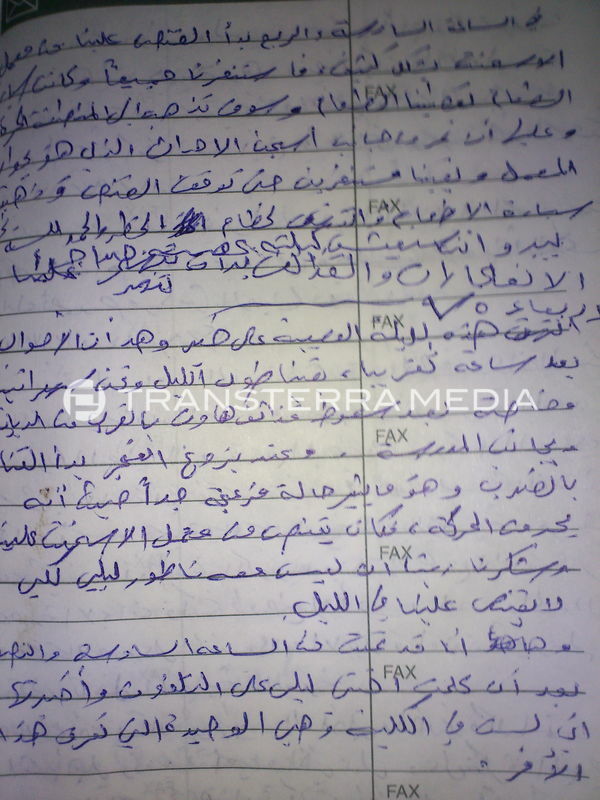 The FSA fighters found the soldier's diaries in their office and took photos of some pages. At 6:15 shooting started heavily toward our location from the cement factory. We all mobilized and the food car was giving us food, and then it went to the free area and it had to pass by the Juvenile prison which is next to the cement factory. We stayed mobilized until the sniping stopped and the food car left the place and the danger was gone, thank God. It seems like we are going to live. That difficult night is gone in a good way and things became calm after approximately an hour, we stayed awake all night especially after the fall of mortars near the school. When the sun started to rise, the sniper started to shoot, which is annoying because it limits our movements. He was sniping from the cement factory toward us. Thank God that he doesn't have a night telescope so he can't target us at night. Here I am at 6:30 after I called my sister Laila on the phone and told her that am not in the infantry school, and she's the only one who knows that.